This is a chapter from book 2. It is a chapter that will tell a partial story of the days of Sanctuary. 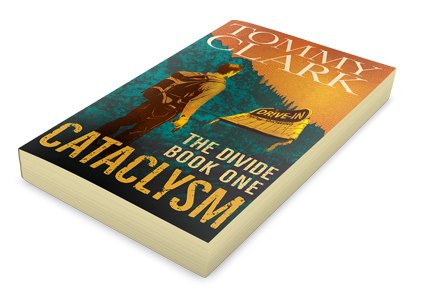 It may be a spoiler to those who have not yet read Cataclysm. The third round of the Gauntlet was underway. Stuart stood in front of a small wooden door and waited. Tobias was somewhere out of sight revving up the crowd. It had seemed as though there were more out there this time around. It sickened him that these men there to watch the suffering inside the sick game. “The third and final round of this Gauntlet is the labyrinth. These men have fought hard to prove their worth. They have shown their strength in the melee to gain the upper hand in the Monkey bars. From there they showed you their will to win. It was close, but these four men are now here to show just how much they want to be here. Only one will come out victorious here. Four men will enter the labyrinth and only one will come out the other side. There are walls in place to prevent the contestants from knowing where the others are. Was Stuart going to have to kill to get out of this ignorant gimmick of punishment? He never thought it would come to that. It was ridiculous and surely the others would agree. The door slid open. What if Stuart remained in the small enclosure behind the door? Would they force him out? Would they force him to compete? He knew that it was only a matter of time before Jared found him. Jared made it clear that he wasn’t taking things easy on Stuart and had told Stuart that he would be, in fact, coming for him. Stuart timidly stepped out from the small enclosure and the door slammed shut behind him. It turned to look at it for a moment then return his gaze on the stretch of pallet board in front of him. To one side there was a small panel in the wall, resting on the shelf was a small revolver. He held it in his hand, inspecting the Blue Steel. It was a TAURUS 905. They were popular for a conceal and carry gun since they cost less but were still a reliable gun. Though most people would opt for the .357 but the 9mm would still put someone down for a moment or two. A flash of movement ahead caught Stuart’s eye. He glanced up from the gun and waited. There wasn’t anything else. Was he seeing things? He took a step. He opened the cylinder to look at his ammo. The gun could hold 5 rounds in the stellar clips. In this particular one, there was only one. He rolled it to the appropriate position and closed the cylinder. He hoped he wouldn’t have to use it, but with Jared in the labyrinth with him he may find that he would need it. Stuart found himself at the end of the path. Where it ended, it turned in two directions at a T. He decided to start by going left. As he walked he could hear movement, someone was on the other side of a walls. There was no getting to them. He continued down the path and was forced to make a few more choices of direction. He picked up a small nail that had been lost in the construction and marked the paths he chose as he went. He stopped to look up. The crowd had seating that was high above the labyrinth and they could see down in it. He watched the eyes of those watching. Some watched him and others followed along where there must had been another contender. He noticed a familiar face in the crowd. It was Chigger. Chigger stared intently at him. Stuart gave him a slight nod. Chigger made a motion with his head and Stuart followed. When he found another place where the path forked he looked back to the crowd. Chigger was there watching and nodding slightly. This went on for a couple of minutes until Stuart stopped at a wall. It appeared to be a dead end. The only way he could go was to climb a crate up through a small pass through. He did so and landed on the ground on the other side. He continued down the path, taking each corner slowly and with the slight nod of Chigger. Finally Stuart stood in a long passageway. He looked around at the surroundings. It was a slightly larger path, with pillars that spotted throughout. They had been built and wrapped in the similar wood from pallets. As he stood he could hear the crowd roar. Someone had been eliminated. Stuart raised the gun and looked down the sights. He glanced up to the crowd and Chigger simply looked at him, stunned. He seemed to understand the brutality of the labyrinth. He just looked at Stuart, his stern gaze now replaced with one of burden and sorrow. Whether Stuart won or lost someone would die. He would have to kill or be killed. He thought briefly about setting down and tossing the gun out in front of him just to be done with it. What was he fighting for anyway? A place among the ranks of a community that has taken a savage turn in recent months. He didn’t want that. A large man came into his view. The large bald-black man stood, his gun at the ready. He and Stuart locked eyes at the same time and pulled the trigger. Both men dropped their guns and fell to their knees. Stuart grabbed his stomach. The pain was nothing more than a strange force at first, then it grew to an immense pain that doubled him over and he passed out.